It’s that time of year again. No, I’m not talking about the holidays. I wish I was referring to that. It is the time when employees all over are getting information about continuing coverage for 2010 on their medical insurance. The reality is that most people with health insurance coverage will be seeing increases. Not just small increases, in most cases premium changes that are ten or more percent. This hit home for us the other day. Sketchy details were sent home that our medical insurance premium will be going up 12%. This means that our family will basically be getting a decrease in pay. Why? Well, when a pay freeze is instituted and premiums go up, this equals less money coming in. We are bracing ourselves for more specifics of the plans. We know that the premiums are increasing, but do not know just what it will mean for our co-pays. From 2008 to 2009 we saw the co-pay for hospitalization alone go from $500 to $1000! Talk about a massive change. We are not alone. Since I found out about this almost everyone I know has mentioned similar instances. Of course our 12% looks like nothing compared to a family member that is seeing a 28% increase – yikes! Please know that given the state of the economy, I am thankful each day that we have a means of income, a house, food on our table and all of the items that many Americans are not blessed with. Have you heard about changes in your medical insurance premiums yet? Will they be increasing or decreasing? For anyone without health insurance coverage, please know that I hope for things to change. Too many people do not have benefits and this question was not meant to insult anyone. BTW – Be sure to check out two giveaways that are going on right now. One for a Yoplait Kids Yogurt prize package and a new one for the Softlips Limited Edition Winter collection. I haven’t heard anything yet. I have not received anything yet. We are pretty fortunate that our insurance is pretty good. Although, I am starting to hear some scary things about it on the news. We have Motion Picture Health and they have their own hospitals throughout the LA area, recently they had to close one….hmmm…I guess we will have to wait and see. 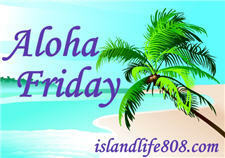 .-= Michelle M´s last blog ..Aloha Friday – Comfort Food =-. Haven’t heard anything yet but Hubby’s retired AF so we’ve just stuck w/ our military stuff. .-= Sues2u2´s last blog ..Aloha Friday – 13 Nov =-. Yes, we just went to a meeting for husband’s work about his insurance. Our premiums are going up. We opted for the less expensive plan this time though so ours will actually go down, but of course that’s becasue they cover less if we have medical expenses. I have not heard anything as yet, but I will ask dh since he would know. .-= JamericanSpice´s last blog ..Aloha Friday: Issues of the heart =-. .-= Niky @ Design It Chic´s last blog ..Aloha Friday!!! =-. I have heard that cost will increase a cross the board. ZJust waiting for the letter. I am sure we will see more unnecessary deaths in the coming years. I have not seen it, but I will have to look at the difference…we are changing from my coverage to my husbands. I have not seen much of a change, but I certainly understand that it is a real concern for many people. I am seriously hoping that the health care bill does not go through. We need to open insurance options across state lines and allow capitalism to work. .-= Serendipity is Sweet´s last blog ..Aloha Friday – November Nor’easter =-. Ours continues to increase at alarming rates. .-= Jennifer´s last blog ..Friday the 13th – Aloha Friday =-. I was surprised to see it had stayed the same considering they seem to rise every year. I’m not anticipating any increases. *crossing fingers* My husband is a police officer, so any increase in health insurance would mean a decrease in pay as well. .-= Jen´s last blog ..Aloha Friday! Black Friday? =-. My husband will be changing jobs sometime in the near future so our health coverage will also change. Pretty certain there will be a more expensive premium to look forward to. the cost of ours went up 17%. That is insane! .-= Stacie´s last blog ..Aloha Friday – Vacations =-. I haven’t heard anything about our premiums going up. I sure hope not. We are barely getting by right now. .-= shelly´s last blog ..Aloha Friday: I’m Feelin’ Soupy =-. While our system is flawed…I am so thankful for it when I read things like this. Health care should be affordable and accessible for Everyone!! Yes ~ we have insurance through my hubby’s work and we also pay to have Tricare Prime (benefit as a retired military, but we DO have to pay annually for it!) – both have gone up! But we feel so very fortunate to have a secondary insurance at this point. .-= Ollie McKay’s´s last blog ..Chick Flick Friday ~ And Aloha Friday too! =-. we get our insurance thru my hub’s company. they have a wonderful insurance system. the rates have gone up this year, but not by much. it happens every year, even with copays. they offer these “healthy” options where you have to spend your time with a nutritionist, trainer, medical professionals, on a regular basis for lower rates. it is meant for those with chronic conditions. we are all healthy here, so we do not want to participate. Lucky for us the company is absorbing all of the increases this year. The had a loss of something like 30 million. They are increasing it a store level by charging each store more medical per employee. We won’t feel the change in our medical bills but we will in our monthly bonus. Our bonus is calculated based on the net profits of the store each month. The cost of medical benefits for each employee comes out of the net profits every month. .-= Kimberly@PrettyPinkMomma´s last blog ..Aloha Friday – Blogiversary =-. You can expect premiums to increase and coverage to decrease along with other costs rising. I just know that ours will go up, but haven’t been told yet how much. We have really really good coverage (medical, dental, and vision), so I know that I can’t complain about what portion I have to pay for when so many people have to make do without good coverage or any coverage at all. But I know that it will definitely hurt–pay freezes plus higher insurance rates and higher deductibles, adding Maggie to our coverage, plus now the cost of day care added to our expenses–it’s going to be a rough road ahead. And, truthfully, if it wasn’t for my benefits, I’d be staying home instead of returning to work. But since Mike’s company doesn’t offer ANY insurance, it’s back to work I go . . . .
.-= Shawna´s last blog ..Beginning =-. I just lost my job so soon we will have ZERO insurance. Stinks! .-= Melanie @ Whimsical Creations´s last blog ..Aloha Friday #4 =-. So far, no news. But, I dread it. Our plan years go from July to June, there hasn’t been an increase in our school district insurance (which I stopped subscribing to after I had Zoe) in three years, but teachers are paying about $100 every 2 weeks. From what I understand, costs have not changed and may have dropped a little bit for our insurance consortium in that time period. John’s insurance is still pretty reasonable at about $30/week. We’ve also got better coverage, more doctors etc. with the company they switched to this past summer. I guess we’ll have to wait for summer to find out about changes. .-= Kim´s last blog ..Lazy Saturday =-. I haven’t heard anything about my premiums going up but I’m a little scared of that. My DH & I have individual coverage because we own a small business so those could go up at any time. I’m crossing my fingers that something gets done with health care reform. I’m not sure if the current proposal is what we need exactly, but at least we are talking about change! No news here yet, but I’m trying not to complain if they do go up. For the first time in over 4 years my husband (and SAHD) will ACTUALLY be insured. We are so happy for the affordable insurance at my new job!